Let’s take a look at 50 cataloged examples that UNEQUIVOCALLY prove that Die Hard is a Christmas movie! If there’s any debate on the internet that’s finally reached a boiling point, it’s this whole “is Die Hard a Christmas movie or not” debacle. For many, it’s not even a debate any more, rather it comes down to a “is Die Hard the best Christmas movie or not” discussion. For others, who REFUSE TO FACE THE FACTS, it’s possibly just an example of willful ignorance. Now, fresh off the news that there will be a sixth Die Hard - a prequel and tentatively titled ‘McClane’ with Bruce Willis attached - we aim to settle this discussion, debate, annoyance once and for all. From our friends at the Ultimate Action Movie Club, one Die Hard fanatic has presented five concrete reasons plus painstakingly cataloged 50 defined examples of Christmas references in Die Hard. 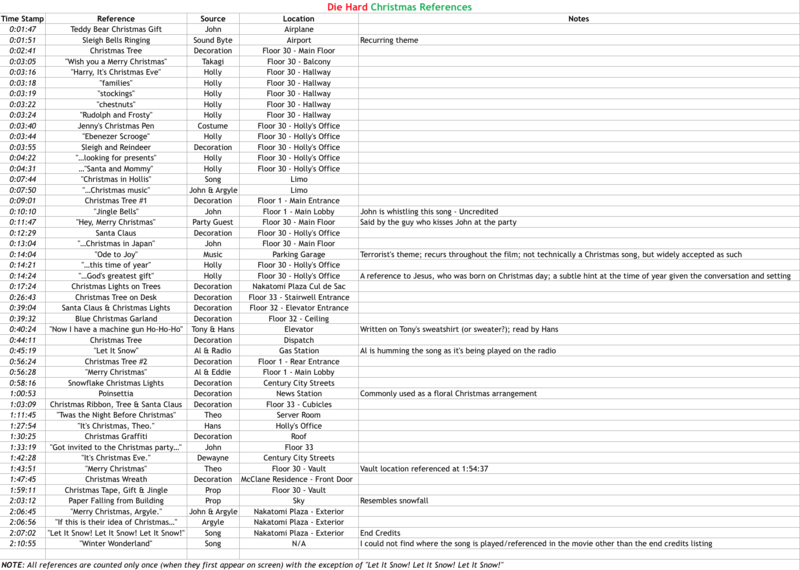 To truly breakdown all the Christmas references in their entirety, you can check out the original spreadsheet here. But rest assured, this list is the result of meticulous work indeed. It not only includes every mundane Christmas cue, but also any and all Christmas office decorations, lobby music snippets and minute throwaway conversations. As you can see below, we’ve further broken things down into four categories - sound & music, props, script, and set decoration - with time-markers, location and source (whether that be person who said the line or where/how it appears in the film). These are examples of Die Hard taking place at Christmas time, not examples of Die Hard as a Christmas movie. A romance movie could have fifty guns in it, but that doesn't make it an action movie. What are the tropes of a Christmas movie? What are the themes? What defines it as a genre? How does Die Hard represent & play with that genre?